Draft: 2007, Oakland Athletics, CAth rd. Sean Robert Doolittle...Graduated from Shawnee (NJ) High School...Attended the University of Virginia and left as the school's career RBI leader (167)... Also compiled 21 wins as a pitcher, which is the best in Cavaliers history...Named ACC Player of the Year as a sophomore in 2006 and also earned All-ACC honors in 2007...Was inducted into UVA's Hall of Fame in January of 2018...Along with his wife, Eireann, is involved in numerous charities. Earned his second career All-Star selection after very strong first half...Was one of the top relievers in MLB to start the season, recording 22 saves and a 1.45 ERA in 35 games before being placed on 10-day disabled list on July 10...Missed 54 games with left-toe inflammation... Returned from the DL on Sept. 2...All told in 2018, put together one of the most historic seasons by a relief pitcher in Major League history... According to Baseball-Reference.com, his combination of 0.60 WHIP and 10.00 strikeout-to-walk ratio was the second-best in Major League history, joining Boston's Koji Uehara in 2013...Doolittle and Uehara are the only two relievers in Major League history to put up those numbers in a season...Offered scoreless relief in 37 of 43 appearances...Led National League relievers in opp. on-base percentage (.178), opp. slugging percentage (.213), opp. OPS (.391), WHIP (0.60) and save percentage (96.2%)...Ranked seventh in the NL with 25 saves...Trailed only Cleveland's Dan Otero (5) for the fewest walks (6) among pitchers with at least 45.0 innings pitched...On April 11 at Atlanta, he intentionally walked Freddie Freeman in the 10th inning...Did not issue another walk until Sept. 11 at Philadelphia (9th inn., Santana), a span of 30 games (32.0 IP), striking out 39 batters during this span...Following the season, was named a recipient of the 2018 Bob Feller Act of Valor Award for his values, integrity, and dedication to serving our country that Bob Feller himself displayed. Began the season with Oakland before being acquired by Washington, along with RHP Ryan Madson, on July 16...Went 21-for-22 in save opportunities with Washington...Converted 21-of-21 SVO before his last outing, Sept. 28 vs. PIT...Went 1-0 with a 2.40 ERA, 31 strikeouts and eight walks in 30 games with Washington...The Nationals posted a 30-0 record in games he pitched following the trade...Including his first half of the season, with Oakland, ranked ninth among all MLB relievers in WHIP (0.86), and 11th in SO/BB ratio (6.25)...Was particularly tough against left-handed batters, limiting them to a .146 average (6-for-41) with one double, three walks and 14 strikeouts...Ranked second in the National League (tied for third in MLB) in saves after the All-Star break with 21, trailing only MIL's Corey Knebel (25) in the National League...Was named National League Reliever of the Month in September after posting a 1.64 ERA (2 ER/11.0 IP), 14 strikeouts, three walks and was 8-for-9 in save opportunities...From July 30 through the end of the season, ranked fourth among MLB relievers with a 1.38 ERA (4 ER/26.0 IP)...Recorded his first career Postseason save, closing out Game 2 of the NLDS as Washington won, 6-3...Also closed out the win in Game 4, but was not credited with the save as Washington won, 5-0. Was 2-3 with four saves and a 3.23 ERA in 44 games in a season shortened by a two-month stint on the disabled list with a strained left shoulder…struck out 45 batters in 39.0 innings (10.38 per nine innings) and walked just eight (1.85 per nine innings)…had a strikeout-to-walk ratio of 5.63, which tied for ninth among American League relievers…had a .231 opponents batting average and .272 on-base percentage…16 of the 33 hits he allowed were for extra bases…had career highs in home runs (6), slugging percentage (.434) and OPS (.705)…his opponents batting average included a .206 (13-for-63) mark against left-handed hitters compared to .250 (20-for-80) against right-handers…issued seven of his eight walks to righties…has held lefties to a .198 (59-for-298) mark in his career…allowed a .099 batting average with two strikes and has a .132 (68-for-516) mark in that situation in his career…yielded a .176 average with two outs and has a .186 (54-for-290) mark in his career…opponents hit .213 with runners in scoring position…the opponents number five hitter went 1-for-18 (.056) off him and he has a .129 (12-for-93) average against them in his career…allowed 5-of-18 (27.8%) inherited runners to score but has allowed just 13-of-85 (15.3%) to score in his career…that is the best percentage in the majors dating back to 2012 (min. 80 ir)…first batters faced hit .350 with a .409 on-base percentage and .625 slugging percentage…the batting average and OPS (1.034) were second highest in the AL, the slugging percentage was third and the on-base percentage fifth…his career splits entering the season were .180/.214/.253/.467…converted 4-of-6 (66.7%) save opportunities…logged a 1.80 ERA and .140 opponents batting average in 17 day games, a 4.13 ERA and .280 opponents average in 27 contests at night…did not allow a home run in 15.0 innings during the day…had a 4.50 ERA in 24 games against AL West competition, a 1.59 ERA in 20 games against everyone else…surrendered 10 of his 14 runs in 16 outings on exactly one day of rest (6.28 ERA)…had a 1.46 ERA in his other 28 appearances…compiled a 0.54 ERA in the eighth inning, a 5.24 ERA in all other innings…did not commit an error in 44 games (six chances) and now has a 193-game errorless streak dating back to Sept. 25, 2012…that is eighth longest in Oakland history by a pitcher…opponents had four sacrifice hits off him, which tied for second most among AL relievers…tossed one inning or fewer in 41 of his 44 appearances and had no outing over 1.1 innings. Missed 121 games due to two stints on the disabled list…began the season on the 15-day DL with a strained left rotator cuff...was reinstated May 26 and pitched the next day against Detroit before returning to the DL May 30 retroactive to May 28 with a strained left shoulder…was transferred to the 60-day DL June 13 and was reinstated Aug. 22…went 1-0 with four saves, a blown save and a 3.95 ERA in 12 relief appearances overall…opponents hit .235, including .225 (9-for-40) by right-handed hitters compared to .273 (3-for-11) by left-handers…surrendered just one home run in 13.2 innings but it was to a left-handed hitter (Calhoun, LAA on Sept. 30), which was his first against a lefty since April 28, 2013 (Davis, BAL)…first batters faced were 1-for-11 (.091) with a walk (.167 on-base percentage)…they are now batting .180 (32-for-178) with eight walks and a sacrifice fly (.214 on-base percentage) in his career…the on-base percentage is fifth lowest in the majors dating back to his rookie season of 2012 (min. 150 batters faced)…allowed his only inherited runner to score but has allowed just 8-of-67 (11.9%) to score in his career…that is second lowest in the majors since 2012 (min. 60 inherited runners)…yielded a .161 batting average with the bases empty compared to .350 with runners on base…opponents were 4-for-11 (.364) with runners in scoring position…did not allow a hit to the opponents number nine hitter (0-for-7) and the nine hitter is 1-for-31 (.032) against him over the last two years…pitched at least one inning in 11 of his 12 appearances, including a season-high 2.0 Sept. 17, 2015 at Chicago (AL)… recorded more than three outs in two of his four saves after tallying just one such save in 2014…did not pitch during the spring and was placed on the 15-day disabled list April 4 with a strained left rotator cuff…began a rehab assignment with Single-A Stockton May 14 and appeared two games with the Ports, one with Double-A Midland May 19 and two with Triple-A Nashville from May 22-24…had a 9.00 ERA (5.0 ip, 8 h, 5 r, 5 er, 5 so, 3 hr) in five rehab appearances overall when he was reinstated from the DL May 26…pitched a scoreless sixth inning the next day against Detroit (1 h, 2 so) but returned to the DL May 30 with a strained left shoulder…made one rehab appearance with Stockton Aug. 7 (1.0 ip) and four with Nashville from Aug. 11 to 20 (4.0 ip, 1 h, 1 r, 1 er, 10 so) before he was reinstated from the DL Aug. 22…was tagged with the blown save in his first outing following his return Aug. 23 when he allowed two runs in the seventh inning against Tampa Bay…converted each of his final four save opportunities beginning Sept. 7 and also had a win over that six-game stretch. Took over as the A's closer in May in just his third professional season as a pitcher and saved a team-leading 22 games…set an Athletics record for saves by a left-hander, breaking the previous mark of 17 set by AlanEmbree in 2007…had three career saves entering the season…walked just eight batters in 62.2 innings andstruck out 89…his strikeout-to-walk ratio of 11.13 was the highest among Major League relievers… based on a minimum of 60 innings pitched, it was second highest in Athletics history (Eckersley, 18.25 in 1990) and tied for sixth highest in the majors since1900…averaged 1.15 walks per nine innings, which ranked third among American League relievers and fifth lowest in Athletics history among pitchers with60 or more innings…averaged 12.78 strikeouts per nine innings, which was the best in Athletics historyusing the 60 inning minimum…had a career-high 89 strikeouts, which ranked ninth among AL relievers…led ML relievers with a .197 opponents on-base percentage…ranked seventh among AL relieversin opponents batting average (.169) and ninth in slugging percentage (.262)…the on-base percentage was third lowest in Oakland history by a reliever and the batting average ranked eighth…converted 22-of-26 (84.6%) save opportunities…ranked seventh in the AL in save percentage and 10th in saves…was 2-4 with a 2.73 ERA in 61 games…his opponents batting average included a .118 (9-for-76) markagainst left-handed hitters compared to .195 (29-for-149) against right-handers…allowed all five of his home runs and issued all eight of his walks to righties…has not allowed a home run to a lefty since April 28, 2013 (Davis, BAL) and has not walked a lefty since Aug. 16, 2013 (Brantley, CLE)…yielded a .235 batting average with runners in scoring position but that dropped to .067 with RISP and two outs…opponents hit .080 with two strikes…first batters faced hit .153 with one walk (.164 on-base percentage)…had the second lowest first batter on-base percentage in the AL and fourth lowest by an A's reliever since1974…ranked 10th in opponents batting average and tied for 10th in first batter strikeouts (22)…has a.186 (31-for-167) batting average and .217 (seven walks, one sacrifice) on-base percentage against first batters in his career…allowed 2-of-12 (16.7%) inherited runners to score and has allowed just 7-of-66(10.6%) to score in his career…the career mark is the lowest in the majors since he made his debut in2012…struck out 63 and walked two in 43.2 innings before the All-Star Break (31.50 so/bb ratio)… fanned 26 and issued six walks in 19.0 innings after the break (4.33 so/bb ratio)…had a 6.00 ERA inthe eighth inning, a 2.29 ERA in the ninth inning or later…had a 1.72 ERA and .135 opponents batting average in 34 games in Oakland compared to a 4.15 ERA and .212 opponents average in 27 games on the road…now has a 2.32 ERA (26 er in 101.0 ip) in 96 career appearances in Oakland compared to 3.81 (33er in 78.0 ip) in 79 games on the road…compiled a 1.29 ERA in 20 day games, a 3.46 ERA in 41 nightgames…stranded all seven of his inherited runners during day games and has allowed 1-of-19 to scorein his career…converted each of his nine save opportunities and logged a 0.57 ERA in 16 games against AL East competition…is 10-for-10 in save chances against the East in his career…compiled a 1.00 ERA and did not walk a batter in seven interleague games (9.0 ip)…did not walk a batter in 16 outings on no days rest (15.2 ip)…the opponents number nine hitter was 1 for 24 (.042) off him…pitched at least one inning in 54 of his 61 appearances. Went 5-5 with two saves and a 3.13 ERA in 70 relief appearances…allowed just 2-of-32 (6.3%) inherited runners to score, which was the lowest mark in the Majors Leagues…dating back to 1974, the first year inherited runner data is available, that is the lowest mark in Oakland history and the sixth best mark in the majors…has allowed just 5-of-54 (9.3%) inherited runners to score in his career…stranded all 13 of his inherited runners at home in 2013…issued just 13 walks in 69.0 innings, an average of 1.70 walks per nine innings…that was the seventh lowest mark among American League relievers…struck out 60 and his strikeout-to-walk ratio of 4.62 was 10th best…had a .214 opponents batting average, including .188 (16-for-85) against left-handed hitters compared to .227 (37-for-163) against righthanders…first batters faced were 11-for-66 (.167) with four walks (.214 on-base percentage)…allowed two first batter doubles for a .197 slugging percentage, which was third lowest in the AL…was ninth in on-base percentage and tied for ninth in strikeouts (22)…now has a .204 (22-for-108) career average against first batters with six walks, five doubles and a home run (.246 on-base percentage, .278 slugging percentage)…compiled a 0.55 ERA and .109 opponents batting average in 14 games on no days rest compared to a 3.93 ERA and .244 opponents batting average in 56 outings on one day of rest or more…now has a 1.69 ERA (5 er in 26.2 ip) in 25 career games on no days rest, 3.51 (35 er in 89.2 ip) in his other 89 outings…allowed a .138 average with runners in scoring position and two outs…held the opponents three and four hitters in the order to a combined .154 batting average…had a 2.52 ERA in 24 day games compared to 3.48 in 46 games at night…averaged 14.8 pitches per inning, which was eighth lowest among AL relievers. OAKLAND: Did not allow a run over his first six games and 5.2 innings, giving him a 9.2-inning scoreless streak dating back to 2012…issued two walks April 22 at Boston, the first time he walked more than one batter in an outing in his career…then had a 16-game, 17.0-inning, 64-batter streak before issuing his next walk June 1 against Chicago (AL), an intentional pass to Alex Rios in the seventh inning … retired 15 consecutive batters from April 28 to May 8…had a career-high 13.2-inning scoreless streak from April 29 to May 29…finished April with a 1.59 ERA and .128 opponents batting average in 12 appearances… then posted a 1.38 ERA, .156 opponents average and did not walk a batter in 12 games and 13.0 innings in May…tossed a season-high 2.0 scoreless innings May 27 against San Francisco…that gave him a 0.78 ERA and .117 opponents batting average over his first 23 games…then allowed two or more runs in four of his next five games from May 29 to June 8…allowed 10 runs in 3.2 innings over that span for a 24.55 ERA…yielded 13 hits for a .565 opponents batting average…followed that stretch by compiling a 1.46 ERA and .176 opponents average over his next 25 games from June 11 to Aug. 12…was charged with the blown save and loss June 20 at Texas when he allowed an inherited runner to score plus one of his own…did not allow any of his 19 inherited runners to score over his final 37 games…tossed a season-high tying 2.0 scoreless innings June 23 at Seattle…posted a 6.57 ERA and .340 opponents batting average in 13 games in June…tossed 1.2 scoreless innings July 14 against Boston in his final outing before the All-Star Break…did not allow a run in his first 11 outings after the break for a 12.0-inning scoreless streak…allowed just four hits over that stretch from July 14 to Aug. 12 for a .105 opponents batting average…had a five-game stretch from Aug. 14 to 26 where he had a win, two losses, two blown saves, an 18.90 ERA and .588 opponents batting average … including Aug. 20 against Seattle when he faced four batters and allowed four hits…the hits were a career high and all four scored, matching his career-high…got Fielder to fly out with the bases loaded Aug. 26 at Detroit to start a four-game stretch through Sept. 1 where he stranded all seven of his inherited runners…finished August with a 6.75 ERA in 11 games…then posted a 0.75 ERA in 10 outings in September…matched his season high with three strikeouts three times over a four-game stretch from Sept. 6-13…was credited with his first save of the season Sept. 7 against Houston when he tossed 1.1 scoreless innings…added a second four-out save Sept. 13 at Texas…had a loss and a blown save in four ALDS appearances against Detroit (4.1 ip, 3 h, 2 r, 2 er, 2 bb, 6 so)…the loss and blown save came in Game 4 at Detroit…now has 11 career postseason strikeouts, which is fifth most in Athletics history by a reliever. Was converted to pitcher late in 2011 and had just one professional appearance on the mound entering the season...appeared in six games at Single-A Stockton, eight at Double-A Midland and two at Triple-A Sacramento before he was promoted to Oakland June 4...spent the rest of the season with the A's, posting a 2-1 record with a save and a 3.04 ERA in 44 appearances in his Major League debut...struck out 60 batters in just 47.1 innings, an average of 11.41 per nine innings...that was the third best average in Athletics history among pitchers with 40 or more innings...walked just 11 batters for a strikeout-to-walk ratio of 5.45...that was 10th best in Athletics history, using the 40 inning minimum...had more strikeouts than innings pitched in 23 of his 44 outings...allowed a .227 opponents batting average, including .195 (22-for-113) against right-handed hitters compared to .286 (18-for-63) against left-handers...yielded 10 of his 14 extra base hits to lefties for a .476 slugging percentage...righties slugged just .265...opponents batted .186 with the bases empty compared to .284 with runners on base...allowed just 3 of 22 (13.6%) inherited runners to score, including only 1 of his last 19...first batters faced were 11-for-42 (.262) with two walks...posted a 2.19 ERA in 23 appearances in Oakland, 3.97 in 21 games on the road...had a 2.73 ERA in 31 night games, 3.77 in 13 day games. Missed nearly the entire season...was placed on Sacramento's disabled list April 7 as he continued to recover from surgery on a torn left patella...while on the disabled list, he began to work out as a pitcher...was both a pitcher and hitter in college at the University of Virginia...was reinstated from the disabledlist Aug. 29 and transferred to the A's affiliate in the Arizona Rookie League...made his professionaldebut as a pitcher that day at the Giants affiliate...tossed 1.0 innings and allowed a run on no hits and one walk while striking out two. Spent the entire season on the disabled list at Triple-A Sacramento as he recovered from knee surgery to repair a tear in his left patella tendon...was added to the 40-man roster Nov. 19. Appeared in just 28 games in his first season at Triple-A Sacramento because of knee problems...batted .267 with four home runs and 14 RBI...added 15 walks for a .364 on-base percentage...hit .333 against left-handed pitching and .232 against right-handers...batted .317 at home and .190 onthe road...did not commit an error in 24 games in right field and three at third base...had three assists asan outfielder...batted .341 with one home run and seven RBI over his first 10 games and .219 with threehome runs and seven RBI over his final 18 contests...had a grand slam and a season high five RBI April18 at Tacoma...homered twice and drove in four runs April 27 against Los Vegas...was placed on thedisabled list May 9 with a strained right knee and missed the remainder of the season...was named theA's 10th best prospect by Baseball America following the season. Split his first full professional season between Single-A Stockton and Double-A Midland andbatted a combined .286 with 40 doubles, three triples, 22 home runs and 91 RBI in 137 games...tiedfor ninth in all of minor league baseball with 65 extra base hits...led the A's farm system in hits (153)and doubles, ranked second in extra base hits and total bases (265), tied for second in runs (89), tied forthird in RBI, tied for fourth in walks (63) and tied for fifth in home runs...had a .305 batting average in86 games at Stockton, which ranked 10th in the California League...led the CL in intentional walks (7),ranked third in slugging percentage (.560) and at bats per home run ratio (18.56) and fifth in on-basepercentage (.385)...with both clubs, he combined for a .290 batting average against left-handed pitchingand .285 against right-handers...hit .321 when leading off an inning...appeared in 107 games at firstbase, 17 in right field and eight in left field...began the year at Stockton where he hit .305 with 18 homeruns and 61 RBI in 86 games...added 46 walks for a .385 on-base percentage...ranked second on theclub in home runs and RBI despite spending the last month and a half of the season with Midland...was named the Best Batting Prospect and Best Defensive First Baseman in the California League byBaseball America...batted .341 at home...hit .368 with 12 home runs and 43 RBI over his first 43 gamesthrough May 19 and .246 with six home runs and 18 RBI over his final 43 games before his promotion toMidland...went 4 for 4 in the second game of the season April 4 against Modesto...had two two-homergames over a 10-game span April 10 at Modesto and April 19 against Rancho Cucamonga...had a seasonhigh five RBI against Modesto...had his second four-hit game of the season May 11 at Bakersfieldand then connected for a grand slam the next day at Lake Elsinore...named to the midseason CaliforniaLeague All-Star Team and went 0 for 3 with a walk in a start at first base in the All-Star Game againstthe Carolina League June 24...was transferred to Midland July 10 and batted .254 with four home runsand 30 RBI in 51 games with the RockHounds...hit all four of his home runs over a seven-game stretchfrom July 25 to 31...had a season high tying nine game hitting streak from August 16 to 23, going 13 for 34 (.382) with seven doubles...played for the Arizona Fall League Champion Phoenix Desert Dogsfollowing the season and hit .293 with eight home runs and 26 RBI in 32 games...tied for third in theAFL in home runs and was named to the AFL All-Prospects Team as an outfielder. Made his professional debut with Single-A Vancouver of the Northwest League and batted .283with no home runs and four RBI in 13 games before he was transferred to Kane County of the MidwestLeague July 3...hit .233 in with four home runs and 29 RBI in 55 games with the Cougars and combinedfor a .243 batting average, four home runs and 33 RBI in 68 games overall...hit .272 against left-handedpitching and .235 against right-handers...appeared exclusively at first base on defense (62 games)...went 3 for 5 with a double and two runs scored in his first game June 20 against Tri-Cities...hit his firstprofessional home run July 13 at South Bend while playing for Kane County...hit a grand slam August20 at Beloit. 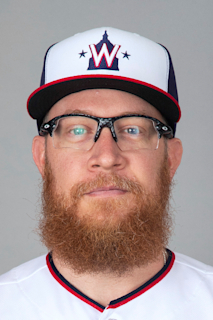 September 7, 2018 Washington Nationals activated LHP Sean Doolittle. July 10, 2018 Washington Nationals placed LHP Sean Doolittle on the 10-day disabled list retroactive to July 7, 2018. Left big toe inflamation. July 10, 2018 Washington Nationals placed LHP Sean Doolittle on the 10-day disabled list retroactive to July 7, 2017. Strained left big toe. July 18, 2017 Washington Nationals activated LHP Sean Doolittle. June 10, 2017 Oakland Athletics activated LHP Sean Doolittle from the 10-day disabled list. June 7, 2017 Oakland Athletics sent LHP Sean Doolittle on a rehab assignment to Nashville Sounds. June 2, 2017 Oakland Athletics sent LHP Sean Doolittle on a rehab assignment to Stockton Ports. May 3, 2017 Oakland Athletics placed LHP Sean Doolittle on the 10-day disabled list. Left shoulder strain. September 2, 2016 Oakland Athletics activated LHP Sean Doolittle from the 15-day disabled list. August 15, 2016 Oakland Athletics sent LHP Sean Doolittle on a rehab assignment to Nashville Sounds. June 30, 2016 Oakland Athletics placed LHP Sean Doolittle on the 15-day disabled list retroactive to June 26, 2016. Strained left shoulder. August 22, 2015 Oakland Athletics activated LHP Sean Doolittle from the 60-day disabled list. August 11, 2015 Oakland Athletics sent LHP Sean Doolittle on a rehab assignment to Nashville Sounds. August 7, 2015 Oakland Athletics sent LHP Sean Doolittle on a rehab assignment to Stockton Ports. May 26, 2015 Oakland Athletics activated LHP Sean Doolittle from the 15-day disabled list. May 22, 2015 Oakland Athletics sent LHP Sean Doolittle on a rehab assignment to Nashville Sounds. May 19, 2015 Oakland Athletics sent LHP Sean Doolittle on a rehab assignment to Midland RockHounds. May 14, 2015 Oakland Athletics sent LHP Sean Doolittle on a rehab assignment to Stockton Ports. September 12, 2014 Oakland Athletics activated LHP Sean Doolittle from the 15-day disabled list. June 4, 2012 Oakland Athletics recalled LHP Sean Doolittle from Sacramento River Cats. May 29, 2012 Sean Doolittle assigned to Sacramento River Cats from Midland RockHounds. April 25, 2012 Sean Doolittle assigned to Midland RockHounds from Stockton Ports. April 2, 2012 Sean Doolittle assigned to Stockton Ports. March 11, 2012 Oakland Athletics optioned LHP Sean Doolittle to Sacramento River Cats. October 1, 2011 Sean Doolittle roster status changed by Oakland Athletics. August 29, 2011 LHP Sean Doolittle assigned to AZL Athletics from Sacramento River Cats. March 13, 2011 Oakland Athletics optioned Sean Doolittle to Sacramento River Cats. November 19, 2010 Oakland Athletics selected the contract of Sean Doolittle from Sacramento River Cats. September 21, 2010 Sean Doolittle roster status changed by Sacramento River Cats. May 1, 2010 Sean Doolittle assigned to AZL Athletics from Sacramento River Cats. April 6, 2010 Sacramento River Cats placed RF Sean Doolittle on the 7-day disabled list. September 22, 2009 Sacramento River Cats activated RF Sean Doolittle from the 7-day disabled list. May 10, 2009 Sacramento River Cats placed RF Sean Doolittle on the 7-day disabled list. Left knee tendinitis. April 8, 2009 OF Sean Doolittle assigned to Sacramento River Cats from Midland RockHounds.